Washington’s recent sea change in its Burma policy continues what is fast becoming a new trend: an American foreign policy that stresses the practical over the ideological. The Burmese leadership’s spotty human rights record is well known at this point. However, what is seldom acknowledged is Burma’s geopolitical importance with regards to energy security and the growing naval arms race between China and India. 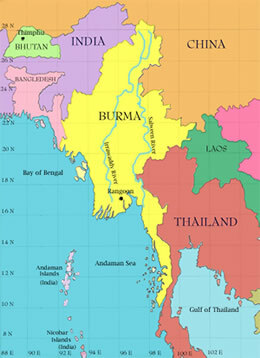 Burma’s strategic location and natural gas reserves have thrust it into the middle of China and India’s energy rivalry. China’s critical Kyaukpyu-Kunming pipeline, a project that will do much to shore up Chinese energy security, is expected to be finished by 2013. The pipeline will not only afford China a pretext for naval deployments in the Bay of Bengal, but also alleviate China’s dependence on oil imports shipped through the Straits of Malacca. India has so far responded to the prospect of Chinese military power on its eastern flank by re-doubling efforts to engage Burma in an attempt to counterbalance Chinese influence there. Given the importance of energy and strategic concerns coalescing around Burma, Washington’s strategy of self-imposed isolation seems less favorable to America’s long-term interests in the region. Burma’s success in drawing in investment from its less ideologically-inclined neighbors – China and India primarily – has caused a re-think in Washington on whether sanctions alone can accomplish any kind of liberalization of Burmese society. The sanction regime has thus far negatively impacted American interests, even though it remains a domestically popular symbol of standing up to human rights violators. In spite of this popularity, the strategy of sanctions without engagement has hurt the Burmese population at the grassroots level and deprived Washington of influence in an important region. The fact that the sanctions regime remains in place can be seen as a face-saving measure on the part of Washington. It is likely that the Obama administration is serious about engagement and eager to sanitize American foreign policy and remove the messianic and democratizing bent that characterized the Bush years. However, to unilaterally roll back sanctions at this point would invite more criticism at home, so expect sanctions to remain for the short term until the engagement process shows signs of ‘progress’, no matter how superficial they might be. Washington’s shift away from a sole reliance on sanctions in the case of Burma hints at a possible long-term shift in American foreign policy. The medium term international environment is likely to be typified by American hegemonic decline. This means that America will be forced to compete with rising powers – mainly the BRIC countires – for influence and energy resources. Unilateral sanctions, particularly those with ideological motivations, are bound to become rarer in an international environment characterized by multipolarity and greater competition. Thus, we can expect Washington’s recent about-face on engagement to become less the exception and more the rule moving forward. In sum, Washington will be less willing to forego influence to make an ideological point, no matter how much of an ‘outpost of tyranny’ the country in question may be.